This classifier set can only be purchased at the same time you buy another Camel Mining product, such as the 12.5 inch Desert Fox Spiral Panner, 18 inch Pro Camel Spiral Panner, 24 inch Pro Camel Spiral Panner, the Mountain Goat Trommel or the Desert Fox/Mountain Goat Combo. Classifier set shipped with main product. Professional prospectors will tell you that proper classification of placer material is the most important single step that leads to high recovery of placer gold. You will be amazed how easy it is to recover micro-fine gold, if it has been classified to the approximate size of the gold. Always process the contents of each pot separately. Gold will separate much faster when the lighter materials are less than five times its mass. Specific gravity differences between gold and sand are what makes gold panning machines effective. When grains of gold, black sand and brown sand are compared, it will be noted that if the weights of the grains are equal, the size is greatly different. Likewise, if the grains are classified so that they are uniform in size, then the weights are very different. It is this size to weight ratio that makes classification important when using a panning machine or even when you are panning by hand. The size of the mesh is determined by the number of holes per inch. For example, the size 10 pot has a mesh that has 10 squares per inch or in other words, each square is 1/10th of an inch. 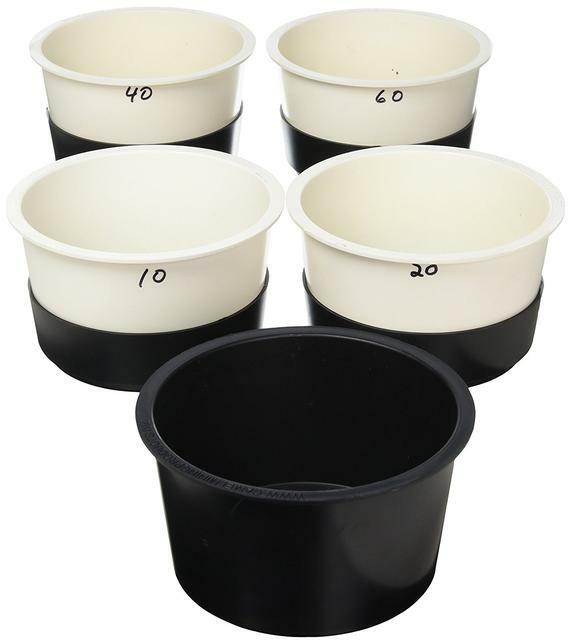 The new pots are made of a tough ABS plastic and are only 5.75″ across and 3.5″ tall making the Camel Classifier Set compact and easy to use. Just put your placer material in the top (10 mesh) pot, nest the other three pots together from largest to smallest and set them into the bottom tub. Then shake vigorously to separate the five sizes.Highest efficiency is achieved if the material is dry, but wet separation is possible by shaking the set in water. 10 Mesh Pot – This pot has a 10 X 10 mesh stainless steel screen. Any material over 10 mesh in size remains in this pot. 20 Mesh Pot – This pot has a 20 X 20 mesh stainless steel screen. All material -10 to +20 remains in this pot. 40 Mesh Pot – This pot has a 40 X 40 mesh stainless steel screen. All material -20 to + 40 mesh remains in this pot. 60 Mesh Pot – This pot has a 60 X 60 mesh stainless steel screen. All material -40 to + 60 remains in this pot. Solid Bottom Tub – The bottom tub doesn’t have a screen. It retains -60 mesh material. All pinpoint or “flour gold” will be found here.